1) Kulkarni Rhushikesh A, Briney Chloe A, Crooks Daniel R, Bergholtz Sarah E, Mushti Chandrasekhar, Lockett Stephen J, Lane Andrew N, Fan Teresa W-M, Swenson Rolf E, Marston Linehan W, Meier Jordan L.
2) Thomas Justin M, Batista Pedro J, Meier Jordan L.
Metabolic Regulation of the Epitranscriptome. 3) Kulkarni Rhushikesh A, Bak Daniel W, Wei Darmood, Bergholtz Sarah E, Briney Chloe A, Shrimp Jonathan H, Alpsoy Aktan, Thorpe Abigail L, Bavari Arissa E, Crooks Daniel R, Levy Michaella, Florens Laurence, Washburn Michael P, Frizzell Norma, Dykhuizen Emily C, Weerapana Eranthie, Linehan W Marston, Meier Jordan L.
A chemoproteomic portrait of the oncometabolite fumarate. 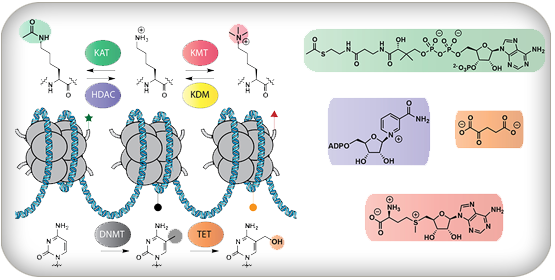 4) Kulkarni Rhushikesh A, Montgomery David C, Meier Jordan L.
Epigenetic regulation by endogenous metabolite pharmacology. 5) Arango Daniel, Sturgill David, Alhusaini Najwa, Dillman Allissa A, Sweet Thomas J, Hanson Gavin, Hosogane Masaki, Sinclair Wilson R, Nanan Kyster K, Mandler Mariana D, Fox Stephen D, Zengeya Thomas T, Andresson Thorkell, Meier Jordan L, Coller Jeffery, Oberdoerffer Shalini.